The club holds show jumping and pole clinics throughout the year on alternate Thursday evenings in the indoor school in Northop. The show jumping clinics are run by club instructor Richard Jones and the pole clinics are run by Paul Davies. 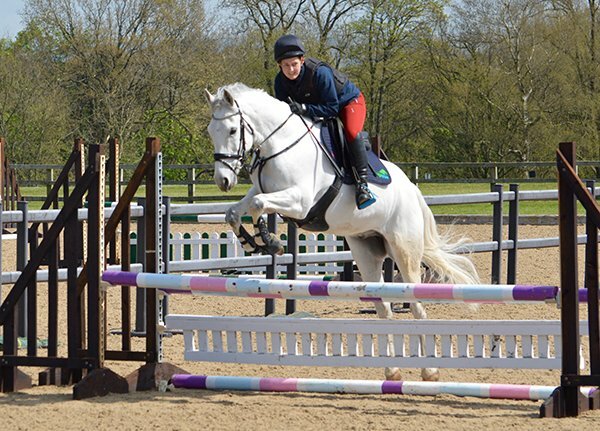 Both pole and show jumping clinics cater for all levels and abilities. The show jumping clinics last for one hour and there are four riders in each group. At the time of booking, please give an indication of your level or the maximum height you wish to jump. To book one of these clinics please use the calendar to the right. Pole clinics are for thirty minutes and have two riders in each session. In addition, the club run show jumping clinics in EquiTi, St Asaph, on some Saturday mornings during the winter months. These clinics are run by Lottie Williams for two or three riders for 45 minutes. When booking, give an indication of your level and preferred jump height and whether you want to be paired with a friend. The club will look at the bookings and try to put appropriate people together. You will be emailed a time slot between 9.30am and 12.30pm. These clinics are open to all abilities and are an excellent way to work improve confidence and technique, whatever your level. One booking form per rider is required. Once you enter a rider and the clinic is in your basket, you can return to the booking calendar to book in another rider. As an experiment during the summer of 2018, the club ran starter show jumping sessions at Mostyn Farm Ride on Wednesday evenings. These sessions were aimed at nervous novices (horses and riders) and were led by Paul Davies. Riders were accompanied around the course by Paul, then they flew solo as part of a mini competition. Those riders who went clear, then went into a jump off. The jumps were no higher than cross poles but the important thing is, riders got the experience of jumping a course of jumps whilst in the care of Paul Davies. Great fun was had, confidence was gained and the club will definitely be repeating this during 2019. The club does not currently run any show jumping competitions but this is something that is being looked into.